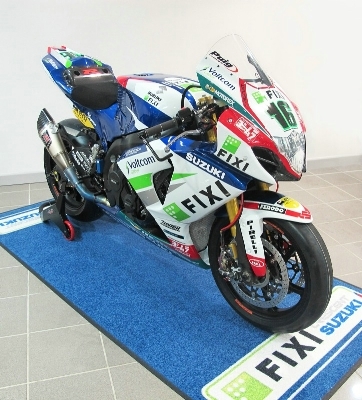 After a difficult start to their debut season last year, with injuries hampering John Hopkins’ campaign, and a power issues with the GSXR-1000, the team showed great progress towards the end of the year, achieving a well-earned rostrum from Leon Camier in Germany. Leon is staying with the team for a second season and comes with high hopes from team manager, Paul Denning. The team have dealt with the issues they faced last season, notably by adding a new engine which was tested in Jerez last week. Despite the test at Jerez being classed as a “shakedown”, to confirm everything was going to plan, Camier finished the test less than half a second off the pace from Marco Melandri’s fastest lap on his Goldbet BMW. 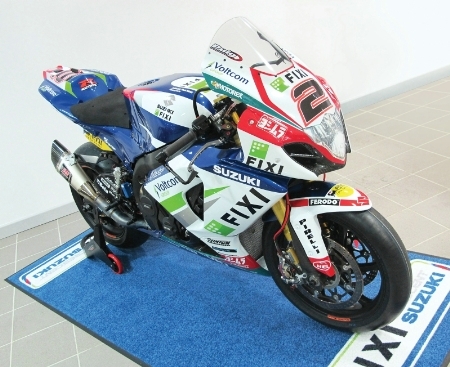 Cluzel’s ride for his debut WSBK season. Ex-Moto2 rider and title contender for the 2012 World Supersport Championship, Jules Cluzel, also joins the team this year. Cluzel, the winner of the 2010 Moto2 British Grand Prix, says he is comfortable with the Suzuki and this showed by setting a lap just over 1.5 seconds slower than Melandri. Although we cannot make firm predictions of his potential, given his form from last season, he’s bound to be progressing toward the top end from the start. The bikes will make their first appearance on track at Phillip Island on the 24th of this month. does this remind anyone else of stoners lcr bike from 2006? Previous Previous post: New ECU for CRT’s hamper second day of testing in Sepang.